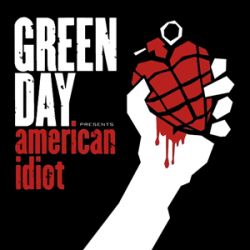 American Idiot is the seventh studio album by the American punk rock band Green Day. It was co-produced with longterm collaborator Rob Cavallo and released on September 21, 2004 through Reprise Records. In mid-2003, the band began recording songs for an album titledCigarettes and Valentines. However, the master tracks were lost and the band decided to start over rather than re-record Cigarettes and Valentines. They decided to produce a rock opera, inspired by the work of The Who and numerous musicals. It follows the life of "Jesus of Suburbia", a sort of anti-hero created by Billie Joe Armstrong. Following early recording at Oakland, California's Studio 880, the band finished the album in Los Angeles.The album achieved popularity worldwide, charting in 26 countries and reaching number one in nineteen of them, including the United States and the United Kingdom. Since its release, American Idiot has sold over 14 million copies worldwide, including 267,000 in its opening week. The album won numerous awards including a Grammy for Best Rock Album, and received acclaim by critics.